In the middle of the 1930s, my grandfather Honess Baggs, moved to Bairnsdale to do survey work with the Civil Construction Corp. Honess, who was a builder by trade, began making coffins and conducting funerals with G.H. Vickers, funeral directors. He later worked for Holford and Craig funeral directors and then Williams and Lee funeral directors before he and my father Buffy went into business for themselves in 1962. 2014 marks 80 years of my family conducting funerals across the Gippsland region. - Stephen Baggs. 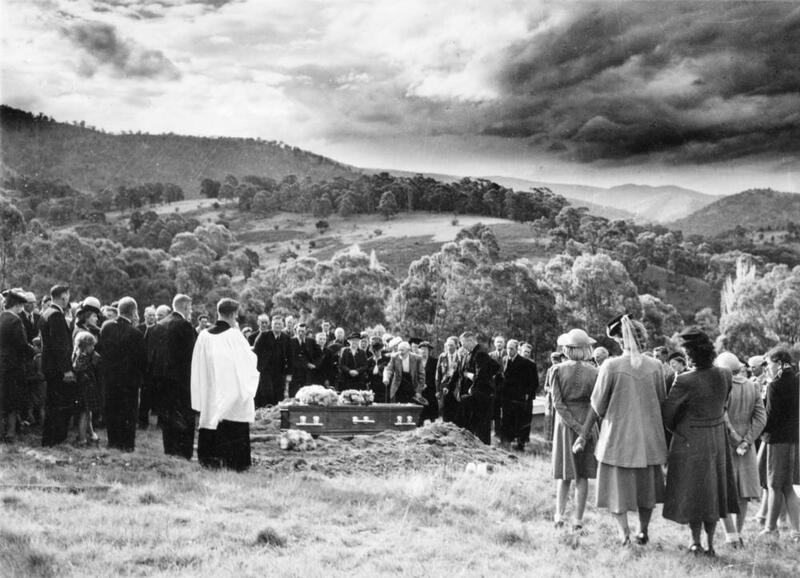 This is Alex Guy’s funeral at the Dargo Cemetery on the 5th of May 1949. My grandfather Honess conducted the funeral while working for Holford and Craig. In this photograph he is standing to the left of the minister at the graveside part of the service. When Alex Guy died he was one of the most highly regarded mountain cattleman of East Gippsland. Continue . . .